Scientists have discovered that a dab of hormones can turn average ants into bobble-headed supersoldiers. According to a study from McGill Univeristy in Canada, any of the 1000-plus species in the Pheidole genus are capable of producing the much larger, giant-headed ants pictured to the right. These ant "supersoldiers" do occur naturally, albeit very rarely, in particularly well-nourished ant colonies, but Ehab Abouheif has found a way to breed them consistently. Ant growth and development is controlled by their exposure to juvenile hormone while in their larval state. 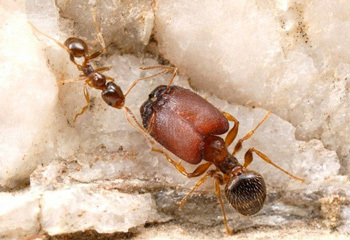 Larvae exposed to limited amounts of the hormone become smaller, worker ants, while those exposed to a certain minimum threshold become much larger soldier ants. It turns out that in most species there is a second threshold controlling the production of supersoldiers. Supersoldier ants are far larger than their regular soldier counterparts and use their comically oversized noggins to block nest entrances should enemy ants draw near. Abouheif believes the supersoldiers are an evolutionary throwback that ant colonies have found some use for. He posits that many species, not just ants, might display such atavisms, but only in social environments, like that of an ant hive, would the throwbacks be viable. "Ants are like humans in a way. We take care of the less fortunate in our society," says Abouheif. "As long as these anomalies can be fed, they'll be taken care of," says Abouheif. "If we were studying a solitary organism, we'd miss this completely." And now, I bet I'm going to see a lot of "I, for one, welcome our new insect overlords," references in the comments. In fact, you could say I anticipate them.